All I've been doing is knitting like mad to get things finished for the photo shoot. It will be close but I think I'll make it. A word about how I mail things...To keep the cost of the course the same, I send back swatches in a large plain white envelope after each lesson by the USPS using First Class rates. This is the least expensive but you can track the envelopes. (For Non-US students, I hang onto the swatches and send them back when the course is complete.) I have only had one lesson out of hundreds lost and one damaged. Periodically due to weather or the holidays a lesson might take a while to get there, but so far every one has arrived. If you would like your lessons sent back by priority mail, include the postage and I'll be happy to return it to you that way. This week's tip is a departure. Many of my Basics students take the course to see if they might want to to the Masters Program. It covers many of the same techniques as Level 1 and it give the students a feel for what it is like to have your work evaluated by a stranger. (My Basics course is divided into three lessons while the Masters work is sent in when the whole thing is complete.) This evaluation process can be very stressful. All of the reviewers have been through the process. The evaluations are very detailed but they focus on ways to fix issues. Each level requires that the work be organized into a notebook and the instructions are very specific as to how to organize the notebook. There are two reasons for this. All of the reviewers are volunteers and the evaluation can take as long as 10 or more hours. A poorly organized notebook can double that time. The other reason is that the ability to read and interpret directions is an important skill for a knitter. Many who complete the program go on to work in the industry and we want to make sure they have the skills they need to do accomplish their goals. We recommend you use a 3" ring binder for Level 1 (By the way, these instructions apply to US submissions. For non-US submissions, there is leeway on this). A 3" binder fits neatly into the USPS Medium Flat Rate box. It should be organized into six sections separated by tabs: Blocking Report, Swatches, Gauge, Worksheets, Questions, Project and References. One of the most often asked questions is why the answers to the questions go in a separate section rather than with the swatches. (Most of the questions refer to specific swatches.) It is easier for the reviewers if they are in a separate section. Believe me, they have the questions memorized. Each swatch should be placed in a page protector with the written information regarding that swatch. 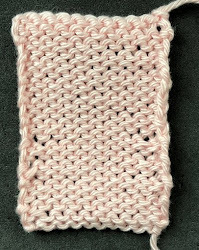 Below is an example of the Swatch Information Sheet (SIS) for the seed stitch swatch. If you staple sheets together or use paperclips, that will add to the review time. If there is a second sheet, it should be placed so that it is visible when the page is turned. This is the project for Level 1. It also should be placed in the page protector along with the written information. I finished the sweater FINALLY. I took the sleeves out twice. I've called it Baby Butterfly. Here is a close up of the stitch pattern. The dress worked up very quickly. I still have all the markers in it as I use them to write the pattern. Here's the front. I'm making a girl's dress that coordinates will the adult dress. A fitted dress looks pretty creepy on a kid so it is an empire waist. This is the back. (The front is blocking. I'll finish it tonight.) The dental elastics mark the decreases for the bodice and I use the safety pins to count the rows. Finishing is much easier if both pieces have the same number of rows. This post is wonderful. Thank you for your post and your time!